I have created this simple and affordable range of jewellery in response to a demand for jewellery for children. While these pieces look just as good on adults, they are ideal for children as being on sturdy leather thong they are safer and longer lasting than silver chains. This is a super piece of jewellery and while new to the webshop has been a great seller at craft shows for a few years now! 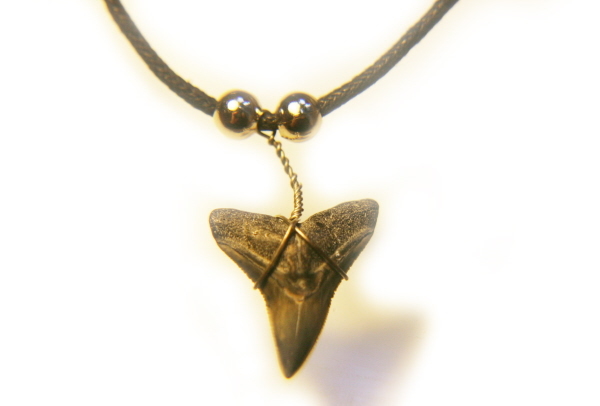 It is a Morocccan fossil Otodus Sharks tooth mounted on black leather thong. The one you will receive won't be this exact one, but of equal quality and very similar. The Otodus Shark is an extinct species of shark that lived roughly 50 Million Years ago in the seas of what is now Morocco. The leather thong measures 18inches and has a sturdy metal clasp for easy wearing. 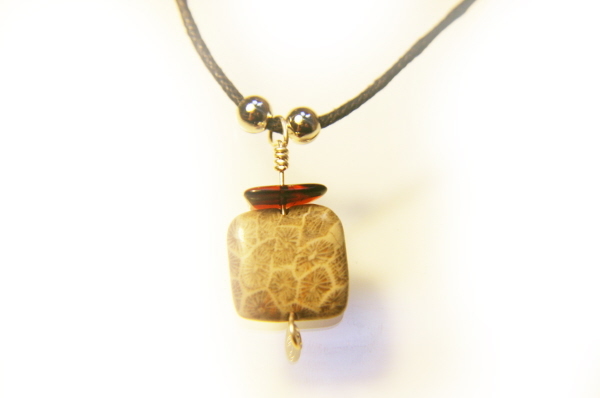 A simple but attractive piece of fossil jewellery! I have taken a lovely little bead of Indonesian Fossil Coral and strung it along with a polished piece of Baltic Amber on a leather thong. The leather thong measures 18 inches and has a sturdy metal clasp for easy wearing. 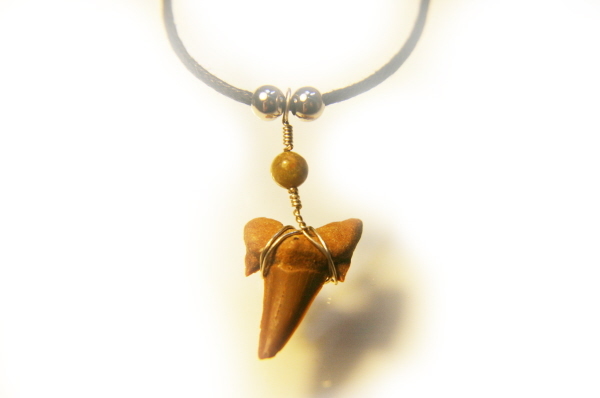 It is a small fossil Sharks tooth mounted on black leather thong. The type of tooth varies with these pendants. I use Lemon, Tiger and Bull Shark teeth. They are all genuine and all beautiful! The tooth will measure roughly 2m from root to tip and have stunning dark grey colouration. Dalmatian Jasper is not a rare or valuable gemstone but has a lovely appearance - white, with black mottling - like a Dalmatian! 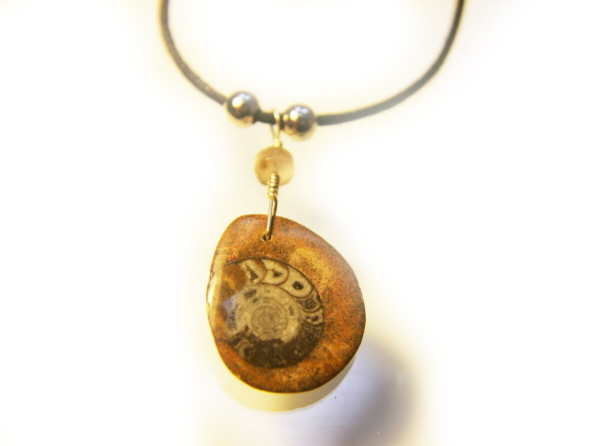 The bead measures 2cm top to bottom. 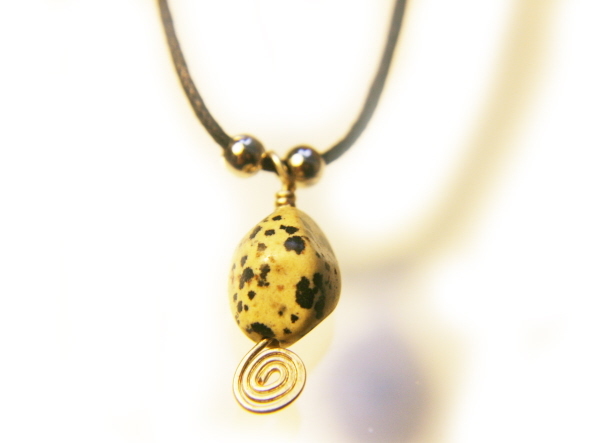 It is a small polished fossil Goniatite mounted on black leather thong. A Goniatite is an ancient sea creature that lived in the seas of what is now Morocco. It was very similar to an Ammonite. 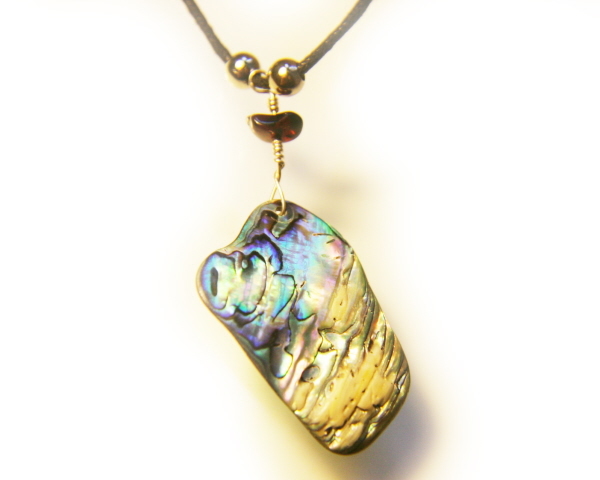 It is made with a lovely polished piece of Paua shell from New Zealand. Also know as Abalone by some this is an exquisite material with a rainbow of shimering colours and patterns . These shells are not fossils but modern shells and are picked off many beaches in New Zealand. You will not receive this EXACT necklace - but one equally beautiful and VERY similar.